Woodward Park, Fresno - Woodward Park in Fresno has hosted every State Championship since the inception of the meet in 1987 making the Clovis Invitational, held on the same course, a top destination for many of California’s best teams. Over 170 teams and 4000 runners from around the state competed in this year’s event. The Warriors battled to some of the top team and individual performances in school history. The girls and boys varsity had no complaints about having to get up early a little early as the temperatures were ideal for some fast running. The girls were first up and ran strong from the start, pushing the pace early and moving up the later miles. Leading the Warriors with a top 10 finish was sophomore Kailey Eddy who completed the 5k course in 19:05, an impressive pace of 6:08 per mile. 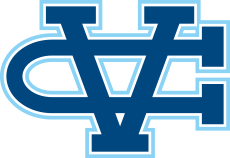 Her time ranks fourth fastest in Valley Christian history. She led an impressive performance and complete team effort by the Warriors as they ran the second fastest time in team history that ranks only behind the State Championship team from 2008. The Lady Warriors finished eighth in the team standings that featured many of the top ranked teams in the State. Nicole Favre flashes a smile at the 2 mile mark. Ashley Lara had a strong performance, arguably her best of the season running 19:49, a 30 second personal best that places her ninth all-time. She was closely followed by Jessica Xu finishing in 19:57, a 53 second improvement over last year’s mark that moves her to twelfth all-time for the Warriors. Karen Mac followed in 20:30, just off her best of 20:25 from her sophomore year. Mac’s performance is a strong indicator the senior has returned to form following a junior year plagued by injury. Nicole Favre earned recognition on the All-Time top 20 list for the State course running 21:31 for her debut. Leia Wang finished an impressive 1:11 faster than last year’s performance running 22:47. Shannon Luu rounded out the top 7 with a welcome finish to her first race this season. All five scoring runners are amongst the top 20 all-time marks for the Woodward Park course. It was an over-all strong performance from the Varsity boys, who held their own despite no seniors on this young team. Leading the team to the second fastest team performance in school history was Jason Li who finished in a personal best 17:45. Tejas Reddy and Peter Enfantino continue their steady improvement running 18:16 and 18:17 respectably. Dean DeMoss was not far behind running 18:27 dipping under the pace of 6 minutes per mile for the first time this season. Freshman Cameron Lockard jumped up to the Varsity level for the meet and finished in an impressive 18:38. Sam Han rounded out the Varsity team running a personal best for the course in 19:19. The Warriors return to competition in the second league meet of the season October 17 at Golden Gate Park in San Francisco.